There is cold wave yesterday, today, and everyday. The weather have been announced to be getting warmer but it is still -10 Celsius. Asides from my house, my car, somebodies house, and somebodies car everywhere is cold. He has done my eye line before and has left Korea doing beauty related businesses in Thailand. One of my friend named Saranghae asked me, "Is anyone who can do permanent makeup?" so I have introduced to her. I often do not recommend any surgery procedure because I can't be responsible if it goes wrong. I just decided to take in the procedure, as it doesn't involve a knife like in doing a double eyelid surgery. So we decided to go after a reservation. The person who was doing the eye line was a makeup artist who could do it very naturally. However when I came out from the bathroom, there was one of employer who was waiting for my approval for the demo eye line drawn for my friend. In other words, the artist was waiting for my OK sign. While Saranghae was doing the procedure I drinking ice tea searching for what to eat for dinner. I love eating lamp's intestines and I can praise them. So I have brought my friend to "Yangmani" in Chundangdong. To be honest it is not my favorite restaurant. 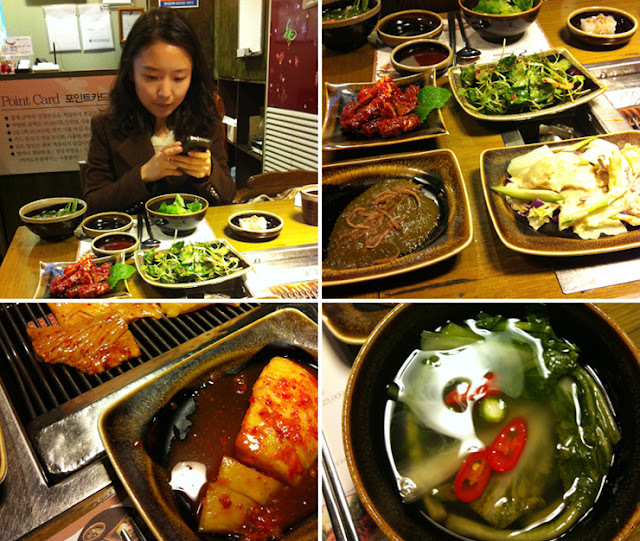 I was so hungry and it was the rush hour time so I decided to go to "Yangmani." There are some differences in taste but the difference is so little therefore going anywhere would be just fine. Any way my friend has grown her hair so long. During the last posting, the hair grew from her perm style. Helps to remove the poisons in the body and I prefer much more than less fat with great amount of protein of lamp's meat than this melting tasty large intestine. But I guess its not only me who has this taste. 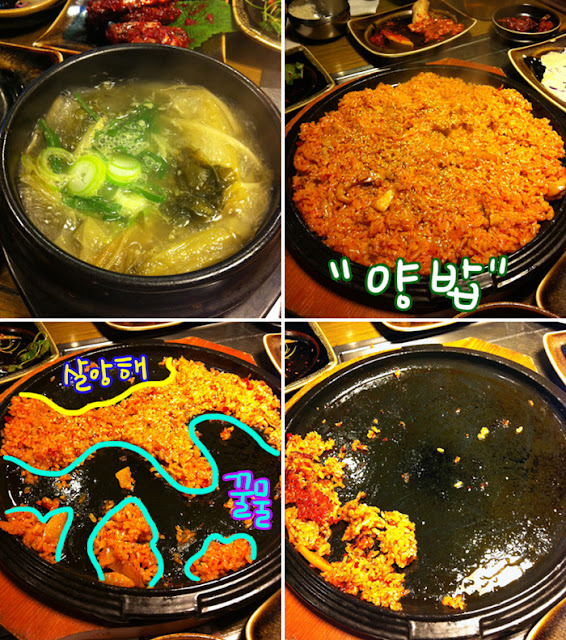 In "Yangmani" Yang rice is the best! After two women eating the large intestine we ate yang rice that was about for 2-3 adults. In Yang mani rice there is kimchi inside it but beyond those taste there is some special taste of yang rice. My friend have paid the dinner.... making me in a situation where having the discount is no use. I have used IPhone 4 right after the it was launched..
A few days ago my friend also purchased the same phone. As I am born as a woman I love technology and communication system design. I was kept texting my friend even before the IPhone was with her. Days before I met a friend telling me about the transparent case. It is known to be Naked Phone in Korea meaning it is used as it is without any case. For me I have place the protect shield from front to back so I didn't really mind about the trend. Originally the grip feeling wasn't fine so I wanted to buy a new case by the recommendation from my friend. But when I got to the store all the product was sold out. 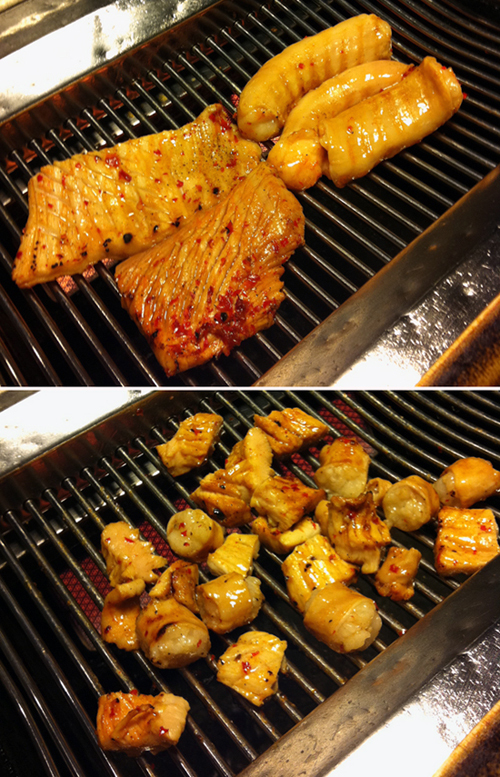 In Apgujeong and Chungdam restaurant appear one day and disappears tomorrow. 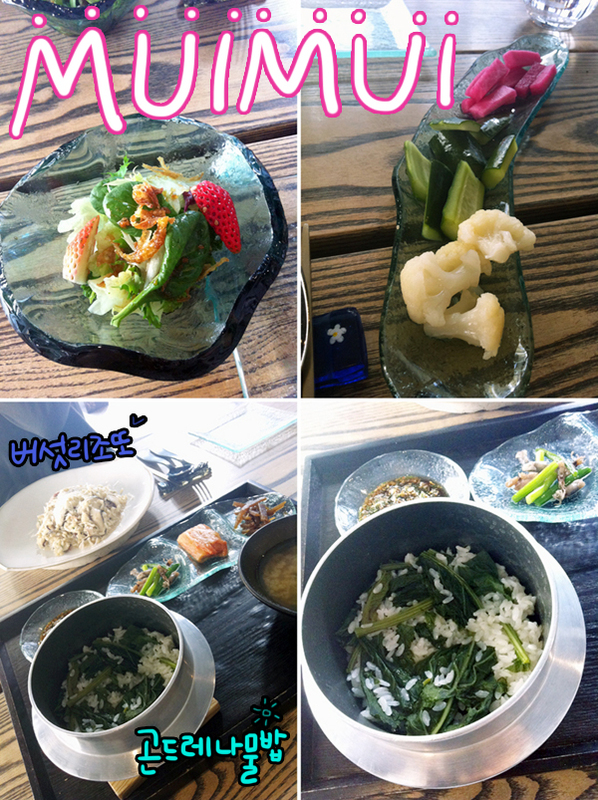 This place is well suited and sells all kinds of dishes. The sofa is so soft that I nearly get buried from the soft cottons. I had some blotches on the face these days so I ordered a Gondre herbs rice. My friend orders mushroom risotto comes with salad. It is perfect place for chilling out at the same time eating delicious meals. My friend and I didn't came here to chat but after eating going shopping in Gangnam. Before shopping she wanted her nails to be done so we sat in the Coffee Bean. My friend came over for this nail product...! The last time she came over to my house, she was being haste wether she should paint her nails with this color or the other color. This time she came over for this new nail color. As I promised her I didn't open it until she came. I was applying the nail color and my cell phone rang. My friend Saranghae was coming to my neighborhood to by a goggle in the department store. So I told her to come to the department store where we are. We when around the department store choosing a goggle for Saranghae and my jeans. Sending Saranghae just home like that, I tempted her to come with us to the Burger king near my house. After eating the burger somehow I started telling them about one of my sad story. I was looking at my friends nail if it will be damaged. The pinky finger looks tiring as she is answering her phone. I but a new top coat in Etude long time ago for a very cheap price but now the company has quitted in producing the product. The products in the shop costs about 3000won to 4000won. It states that it is supper glossy like jelly and it really coats like clustered jelly. I had to paint her nails really carefully. Applying the topcoat before the color dries is important as well as makes it shinny. I can't really say its really bad because it can be my skill as well. The product is not watery instead the feeling is very muddy. So applying the coat too much well make the coating to thick on the other hand making it thin well damage the nail color. It is easy to destroy the nail color. I can't give this junk to anyone so I think I have to use it as glue in daily life. Moving on to the nail colors from the last posting on foundation. I had to use my nails as a demo in showing the colors clearly. My nails haven’t been recovering from the gel nail accident. I bought these 3 nail polishes in Hong Kong. In Hong Kong expo I got to see all the colors at once arrange in the shack. I pick these 3 colors. 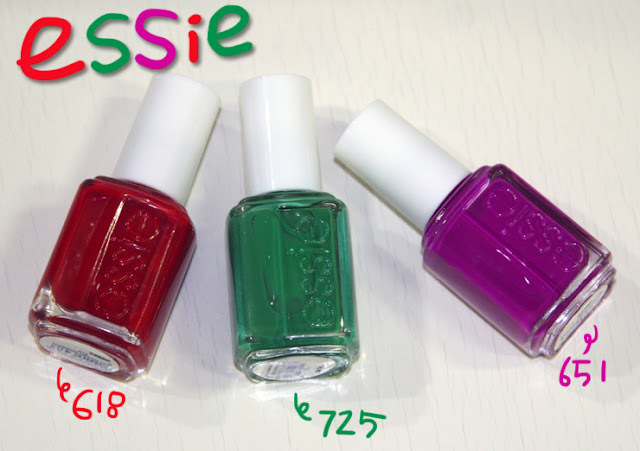 I won't be buying Essie for a while until there are special new collections launched. definitely makes it the best product having only little bit of difference! These colors are easy to find but surprisingly gives perfect shade of color that I have always dreamed of. All the 3 nail polishes are watery compare to other polishes.. So clarity and purity have great impact!! This is the color that has appear in the Makeup Forever foundation posting.. Many viewers were thinking it was Chanel's midnight red. So that much how the color is vibrate. however only these 3 nail polishes. The level is quite high between mid and high in applying the these kind of nail color. The luminosity and saturation is similar so for the people who wasn't able to purchase Chanel's midnight red, they would be pleased by this red color. There is little bit of difference, midnight red gives little bit of maroon color. Can you tell the difference between the picture above and beneath? This product isn't for thin 1 coat. The texture is watery so applying only 1 coat could give messy and unfinished look. Certainly have to apply 2 coats. Applying 2 coats should give clear vivid color but for me it isn't the exact color that I want. Applying twice could look heavy and classic without any gap. For me I apply one thick coat that doesn't make it transparent so it makes it light and looks more free. The difficulty in applying this nail polish is not the brush. Anyone can easily apply but the problem is the texture and the amount that could be controlled. If that doesn't work it makes it messy around the cuticles not making it even. So the solution is to apply several of thin layer. As I have said before for me I like to apply one thick coat but this requires technique. More need in balancing the amount of nail polish. could give a Chanel's midnight red look. Of coarse the price isn't even half of Chanel. Applying 2 coats isn't bad. It could give more classic look. Comparing to Orly green color last time it is totally different. The color isn't too light but elegant. The intensity of color doesn't become dull even after several coats. This is the color my friend wanted to try on. When I done her nails she really enjoyed the color. and use the nail polish. The color is just in the line before passing onto to neon purple. For the people who love purple color should OWN it. It can be said that this color helps to bring the mood up and makes it happy all day long. not even for only fair skin or dark skin goes well. The length of nail doesn't even matter too. Special situation is that aside from those red and green color above the finishing texture of this nail color is more matt. Originally the matt finishing is different form other matt products. This polish color needs top coat especially as same as others. In the picture green and red nail polish I didn't apply the topcoat because I was lazy. However for this color I applied the topcoat. All these products quickly dries compare to other nail polishes. However the watery texture makes it to easily to pill off. That is why topcoat is needed!!!! but quite have high contrast. So applying the color side by side makes it vivid and contrast very nicely against each other. Also applying the silver color could give another charm to this look. Can apply without any rule like the picture above. It would have been better if I showed you guys but I didn't think of it during the photo time. I didn't have time to go and try out the polish after it was launched. I split my time to go to the department store, parking my car illegal and ran to Chanel. When I roughly tested the product I thought of common pearl glitter. Does this worth of 2,9000won.....? Did I see similar color somewhere....? My mind was more on not buying the product. I totally for got about my illegally parked car. I was for a long time in front of Chanel booths thinking weather should I buy or not. 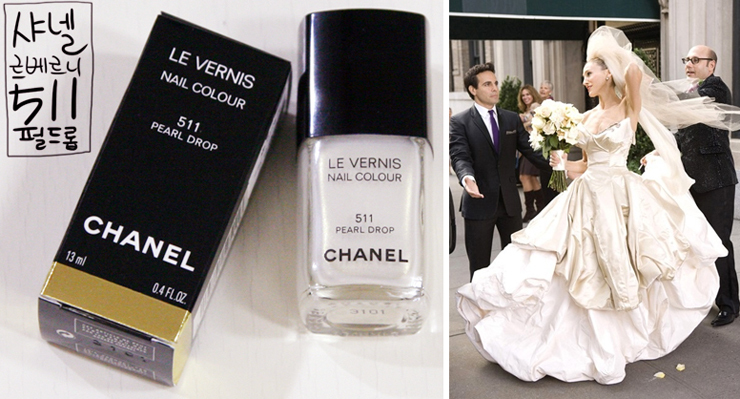 Talking about Chanel Pearl Drop...there is some difference of color at the picture above. There is a limit to my camera and my room light... that is my best photo that I taken. Leaving my disappointment, I have to use all my knowledge in language that I learned for 20 years to describe this nail polish. The color isn't white white but pale yellow. So when I looked at first I thought of ivory color or cream color. When I apply the first coat the color was so transparent. no applying exactly for 2 times. I can tell why the name is called Pearl Drop. All of a sudden all my nails turn into pearls. All my nails are looking elegant and beautiful. Do you remember the Vivian West Wood dress that Jessica Parker wore? That dress was so stunning and reminds me of that color. Anyone who sees this color would really like this. The color that I have used appears to be elegant but not too fancy. Looks bulk but looks high class. Lastly there is a classic look with some kind of vintage. It is like the pearl that have been kept for a long time with extra bit of care. It goes so well with Brides on May and on the other hand it is more cold than a black color. In case like most of women admires a man like man who is strong and good at sports.. but behind that there is delicate sense of cooking that is kind that we can't deny. In summer the color might look to hot but going for vintage look is fine. During the winter, it is perfect for to like the icy princess. Right now I'm into Pearl Drop. "Its pretty but I won't go crazy for it." "Oh well...~ you don't know about fashion." So like that I was inside my world. For me I really love this color. Why? Ordinary I don't own any of this peal color. cause I didn't liked it. So when I looked at it for the first time it has taken my attention. Now this color is one of my favorites. I heard that this color is no limited. In Channel the employer applied 3 coats. There is a difference in handling the amount of nail polish so personally applying for 3 coats is too strong and heavy. Just don't make it transparent and evenly apply the color. The color of the hand skin won't be a matter in taking in the Pearl Drop. 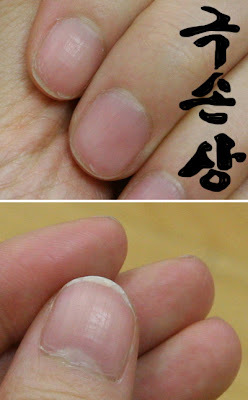 Also narrower finger would be much better but for the thick fingers grow the nails and apply nail polish on them. Like my short nails it has its look. The longer nails would look more elegant but for me that style is too much so I would like to apply to shorter nails. The problem is the finger bones. For the person who was uneven finger bones it makes it look much uneven because of the bright nail color. However all it matters is the person's feeling and their confidence. I think that person who has the pride and the confidence to wear has the rights to do so. Anyone here wants a FREE BURGER KING GIFTCARD?